Summer is in full swing, and our neighborhood blooms with all manner of beautiful plants. Around the corner from our house, one neighbor’s landscaping includes enormous sunflowers, easily more than six feet tall, among other stunning plants that I wish we had in our yard. 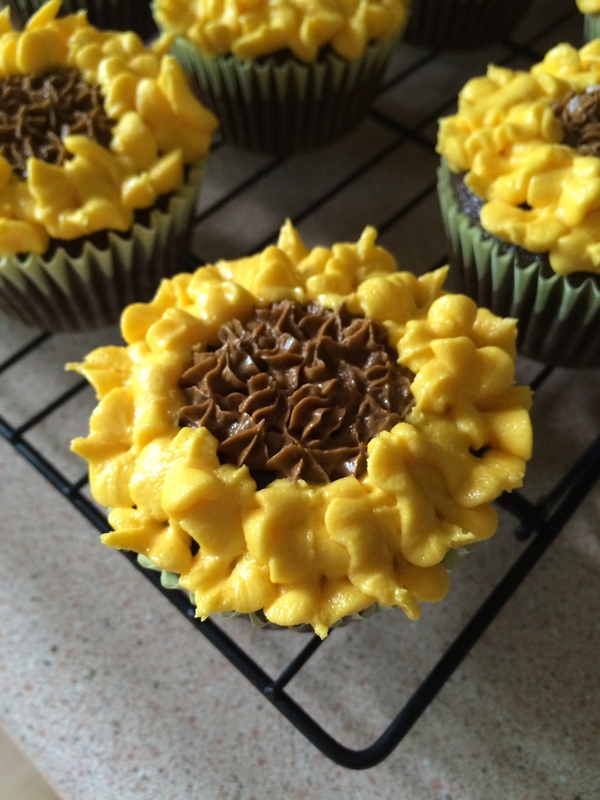 Sunflowers come in many shapes and sizes, and there are probably as many recipes for sunflower cupcakes as well. You’ll find plenty of options on Pinterest, using Oreo cookies as the centers, or chocolate sprinkles; I saw one recipe that used chocolate-covered espresso beans, which seems both cool and kind of pricey. I decided to go with an all-frosting flower to get some piping practice. Buttercream frosting works very well for these, but you could use cream cheese frosting if you like. I chose a chocolate cupcake and basic vanilla buttercream, for pretty (and tasty) results. Prepare vanilla almond buttercream; place 1 cup frosting in a small bowl and tint using brown gel food coloring. Tint the remaining frosting yellow; I used Wilton golden yellow. Fit a piping bag with a small star tip; I used the Wilton 16 tip. Pipe stars in a circle in the center of each cupcake. Fit another piping bag with a leaf tip; I used the Wilton 352 tip. Holding the bag so that the points of the tip are vertical to the cupcake rather than flat against it, pipe petals around the outside of the flower center, covering the cupcake completely. If you like, you can make one outer row and one inner row of petals for more texture; I did this on a few cupcakes, but in the interest of time (and heat – it’s almost 90 in Pittsburgh today) I piped one single row on all of the others. You’ll have plenty of frosting left over, so you can be generous with your piping. I had about 1/4 cup of brown and at least 1/2 cup of yellow, which I’ll reserve for another use.